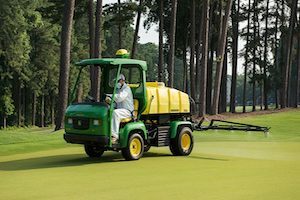 John Deere announced that it has launched its latest GPS PrecisionSprayer. For more information about this product, visit www.Deere.com, or speak to your local John Deere Golf distributor. John Deere has announced that it will soon be launching new fairway mower options with improved budget control. John Deere has announced that it will host a grand re-opening of its store at 1300 River Drive in Moline, Illinois on Saturday, November 11. John Deere has officially debuted the new MICHELIN X TWEEL TURF Airless Radial Tire for 2018 R Series QuikTrak mowers. The Quail Institute is designed to support a new group of young graduates interested in learning more about golf course management. John Deere celebrated the 20th anniversary of its Turf Care manufacturing facility in Fuquay-Varina, North Carolina on July 8. ISU Extension has provided a new series of tips for landscaping professionals who are responsible for maintaining lawns this summer season. Golfers Bubba Watson and Davis Love III will join a host of others participating in the 2017 John Deere Classic. John Deere is planning to host its first-ever Farm Fun Day on Saturday, June 10 from 9 a.m. to 4 p.m. at the John Deere Tractor and Engine Museum. The University of Georgia-Tifton will host the 71st annual Southeastern Turfgrass Conference on May 16. John Deere has announced that it will now offer MICHELIN® X® TWEEL® TURF tires for standalone purchase through its dealers. Students from Penn State University have won the 2017 Turf Bowl, which is sponsored in part by John Deere Golf. John Deere has announced that starting March 1, its attractions in Iowa and Illinois will have extended hours of operation and no admission fees. Fortune Magazine has recognized Deere & Company in its list of the World’s Top 50 Most Admired Companies. John Deere Golf has announced the development of OnLink, a product stemming from its collaboration with OnGolf. John Deere revealed five new ZTrak™ zero-turn radius mowers on Dec. 8, adding to its Z300 line. ASABE has recently awarded John Deere’s 5G Series Tractors and 9009A TerrainCut™ Rotary Rough Mower with AE50 Awards.